Luxury home builder, Jenkins Custom Homes, was honored today as the 6th fastest-growing Aggie-owned business in the world, with an average compound growth rate of 94.13%! The luxury home builder was recognized at the seventh annual Aggie 100 program, sponsored by Mays Business School’s Center for New Ventures and Entrepreneurship at Texas A&M University. 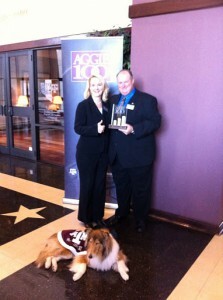 The Aggie 100 focuses on growth as an indicator of job creation, product acceptance and entrepreneurial vision. Recipients of the award were selected based on verified compound annual revenue growth for the 2008 to 2010 period. 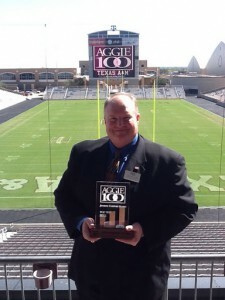 In addition to this honor, Jenkins was also recognized as one of only three companies which have been named in the Aggie 100 for five out of the last seven years since the program has been in existence. This is the longest sustained growth of any Aggie100 recipient. 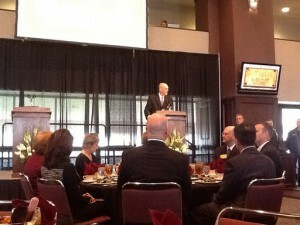 Nearly seven hundred people attended the awards luncheon in The Zone Club at Texas A&M’s Kyle Field. Texas A&M University Women’s Basketball Coach, Gary Blair, presented the keynote address at the luncheon. After leading the Aggie Women to a 2010 NCAA National Championship, it was only fitting that he inspire the group of entrepreneurs by sharing his thoughts on true leadership. Kelsey Assarian, a member of the winning basketball team, sat at the table with Shan & Bethany Jenkins, along with Porter Garner, CEO of the Association of Former Students, and other distinguished faculty. Planning, and the Department of Visualization. After breakfast, Jenkins was given a personal tour of some of the technology being used to design homes and commercial buildings in the Department of Architecture. One such technology, called the “BIM Cave” (Building Information Modeling Cave), surrounds students with display screens which allow them to be immersed in the design from multiple sides. Such technology allows aspiring architects to envision spaces within the home or commercial structure during the design process, a very useful technology which could be used to assist the luxury home builder’s clients as well. To be considered, companies (corporations, partnerships, sole proprietorships) must operate in a manner consistent with the Aggie Code of Honor and in keeping with the values and image of Texas A&M. After receiving the award five out of the last seven years, Jenkins Custom Homes is a shining example of the legacy of leadership. We recently started doing some renovation work on a home our client acquired for $2.5M. Just a few years ago that same home appraised for approximately $5 million. "Wow, things in Austin are worse than I thought," you might say. Well, not really. What happened is that the original builder neglected to install the proper flashing and waterproofing, so what started out as a beautiful $5M home, soon lost half of its value when the underlying water damage began to surface (see photo of removed window sash below). The home sat vacant for several years, and during that time, it's value steadily plummeted. As It turns out that there isn't much demand for a $5M leaky, moldy, rotting home. Inspiration photos from our newest Kitchen remodel, which included matching some existing trim work and rock work.